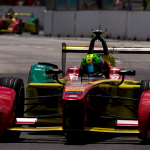 In a guest article for e-racing.net, Edward Hunter takes a look at the Battersea Park protesters, and how they could affect the future of the London ePrix. The result of all this was that residents had to negotiate a total of over 800 HGV’s involved in the circuit construction and takedown for three weeks, because construction began with the park still open to the public until a few days before the race, not to mention that work continued overnight. The park was not signposted properly during this period and it was not clear where residents were supposed to go to avoid construction work. The Spadeoaks builders were inexperienced with the park and were not helped by the fact that the Council did not seem to want the responsibility of having to supervise them, hence their absence during this critical stage. Already after the first year the French Boules Pitch, formerly used by the Gallic community, has been covered in tarmac, and trees present since the 1800’s have been either removed or damaged, with others looking unwell due to their roots being concreted over; it is little wonder that passionate park users reacted so negatively to this disruption, and flocked to the protest group. Perpetuating this, there is no evidence that a health and safety register was ever conducted prior to the event; the Protestors have all requested it from the council and the response they got was that it had been deleted from their databases. In an information age where back-up storage solutions such as the cloud are commonplace, it is unacceptable that such an important document could have been irretrievably lost, hence the skepticism that any thought was given by the council to public health and safety. To put this into perspective, no private sector project would be run without a clear and detailed risk register to prevent and mitigate risks that could lead to injury or death on a construction site. The biggest disappointment for those trackside was the scarcity of good spectator views compared to other Formula E venues due to trees blocking the sight-lines; instead of grandstands there were temporary viewing platforms, but these were only accessible for £30 ticket holders; even then although the view of the track was decent, TV screens were not viewable from several of these platforms. 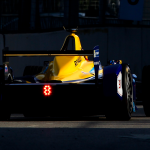 In Autosport magazine’s season two preview for Formula E, Sebastien Buemi, who won the first ePrix in London, heavily criticised the poor views that fans got as well as the lack of overtaking opportunities due to the circuit’s design, citing that there wasn’t sufficient space to make a great track in the Park. If that was the case last season, how on earth will the circuit cope with this season’s significantly faster powertrains without needing vastly more drastic modifications to the park? (I.E. Extra tarmac to widen corners and run-off areas) It should be pointed out though that despite these issues with track design the racing at Battersea, particularly in the second and final race with the championship on the line, was still engaging and exciting to watch and that’s a credit to the drivers and teams able to put on such a fantastic display. But this should not be the deciding factor in whether the race should still be run. It was also felt by the protestors that the crowd was a lot smaller than the 30,000 per day that the Council claimed was in attendance, although I disagree with them based upon, among other things, how packed it was trying to reach the podium from the west side of the circuit at the end of the last race. The final large issue is noise. Some felt annoyed by the (intermittent) noise of the cars themselves, as well as the bass-heavy music produced by the Formula EJ which was broadcast on tannoys during breaks. The standout offender though was the TV helicopter which was felt to be flying excessively loudly and closely in the vicinity of the park for 3 whole days, and it must be said that the aerial racing shots it produced were largely obscured by the park’s lines of trees; again not necessary for the disruption that it caused. On November 24th, a meeting at Wandsworth town hall will take place to discuss the event and it’s future, and the group intends to enact a mass peaceful demonstration onsite, complete with homemade placards and slogans. They are also prepared to do the same during the track build at Battersea if the council is only holding the meeting to justify holding what they claim will be a “better managed event”, a prospect strongly indicated by the fact that the dates for the 2016 London ePrix have already been announced by Formula E.
The protestors are not interested in a “less intrusive” event at Battersea; they want rid of it altogether. They feel they have been manipulated by their council for it’s own financial gain and are not prepared to believe in any more false promises. If Wandsworth Council were to enact the break clause (Unlikely though it may seem) it would have huge implications; it’s clear that Formula E are adamant to keep the race in Battersea at all costs, but can it really afford to be seen as indifferent towards local matters at the venues it visits, particularly as a young brand which needs to build loyalty and trust, and especially when it asks people to give up their park for 3 weeks during the height of summer. Giving out free tickets and keeping a small area in the north east open for dog walkers were seen as token gestures which didn’t solve any of the issues that the event caused. Worryingly this has not been the only Formula E event in which these concerns have come to the fore: already we have lost Miami due to provoking the ire of environmentalists, and even more recently a similar petition and campaign in Lugano has gained traction to prevent any FE race there from coming to fruition too, but the loss of London would be the most damaging blow to the championship and the action group is very much aware of this, which is why recently they have been suggesting the ExCel exhibition centre as a more attractive and viable alternative venue. 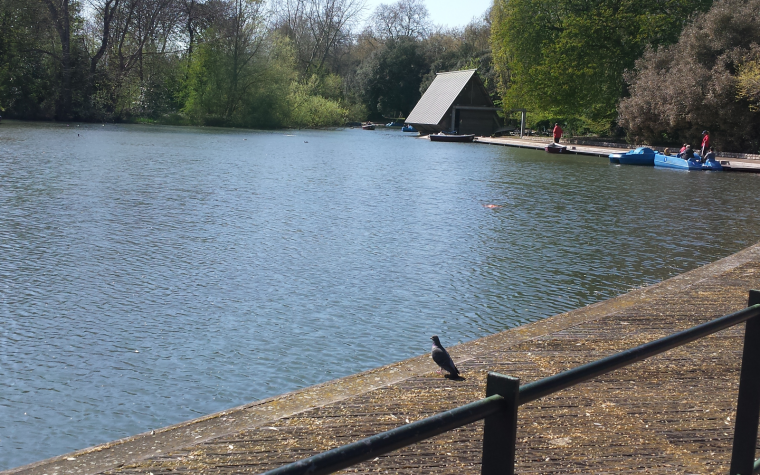 Make no mistake: the Save Battersea Park campaign is not an inherently anti-Formula E one. Many agree with the concept and the drive for EV development that the series offers in principle, and would happily attend a Formula E race were it not being held in their rare Victorian heritage park. In a situation like this, emotions tend to run high. 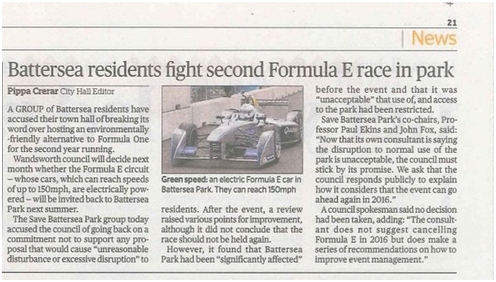 This is not just a political issue, it is a very personal issue for families that use the park; at the same time it is important to hold a Formula E race in London to promote electric vehicles in an area where they will be able to do some good. My job isn’t to judge the rights or wrongs of the situation; my job is to raise awareness though articles such as this. But even though I’m a die-hard Formula E fan and I don’t agree with all the protestor’s points, I still feel a strong sense of guilt about this year’s race which I did not feel at the time. One of the great things about Formula E is that it can go to venues inaccessible to other motorsport championships; the London ePrix was the first FIA level title decider to take place in the UK in living memory, and the first traditional motorsport event to take place in London since Crystal Palace in 1972. Bringing motor racing to a new audience, naturally it’s not always going to be able to please everyone. Let’s not forget though the reason why Crystal Palace was abandoned for international meetings: It had simply become unsafe even by 1970’s standards to race around at over 100 MPH in a public park, and even expensive improvements were not sufficient to prevent the circuit’s closure. In light of the recent fatalities of Jules Bianchi and ex-Formula E driver Justin Wilson, safety should be at the forefront of everyone’s minds; the large bump at the first corner which was causing major accidents and had to be resurfaced should have been anticipated beforehand. Perhaps the true danger though comes in the form of large HGV’s being used to build a racetrack whilst children and parents are on their daily commutes through the park. I do not believe that Formula E fans should be hostile or dismissive of action group, because at the end of the day both groups want the same thing: A better Formula E championship that practices what it preaches. Formula E should not be made the plaything of power-hungry politicians desperate to add to a fake ‘green’ portfolio; Formula E set out from the beginning to become the fan’s championship, a mantle it has earned due to it’s high level of accessibility and fan interaction. This means we as a whole should influence where the series goes; if the public don’t buy into the philosophy behind electric cars because of the negative publicity surrounding Battersea then the series has failed in one of the key aims it set out to do; is a destructive legacy really the one we want to leave? It saddens me to think that I, a 2nd year university student and in many respects a complete outsider to this scenario, may have been the only person remotely connected to Formula E to have actually met with the action group in person. I truly believe that the only way to resolve the conflict is to negotiate with residents, not to ignore them further.